I did not take many pictures of the work in progress. In this picture the tunic is completed with all the filling stitches. The tunic is also sewn with the border I had mentioned previously. I added a small pearl beads to match the embroidery, in between the inner paisley and the outer paisley lines. The filling are worked in two strands of cotton skiens. This paisley is so simple , that it can be used motif for borders. Will make an enchanting border. The kantha embroidery looks beautiful when it gets a woven look. .I was very much impressed with this pattern. 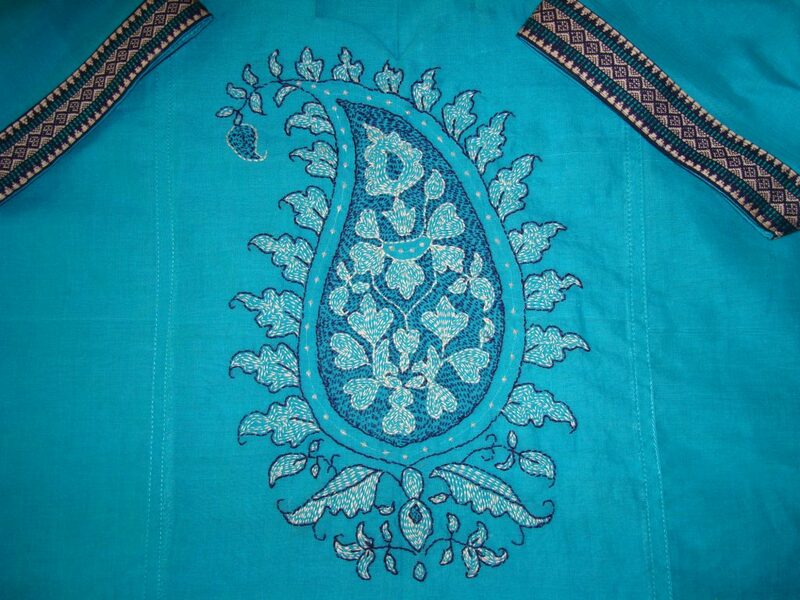 The colours and embroidery are very simple.In this tunic this paisley pattern is the hero! The outlining of the center in this paisley pattern is completed in back stitch in 3 strands . The kantha embroidery [running stitch ] starts from here. I decided to use only two colours based on the border . 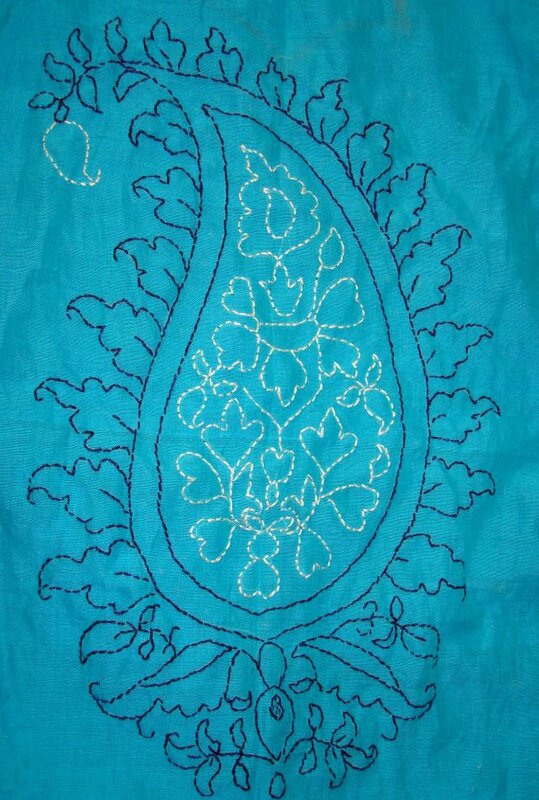 The inner paisley is worked with running stitch filling, in dark blue thread. This was worked with two strands of cotton skein. 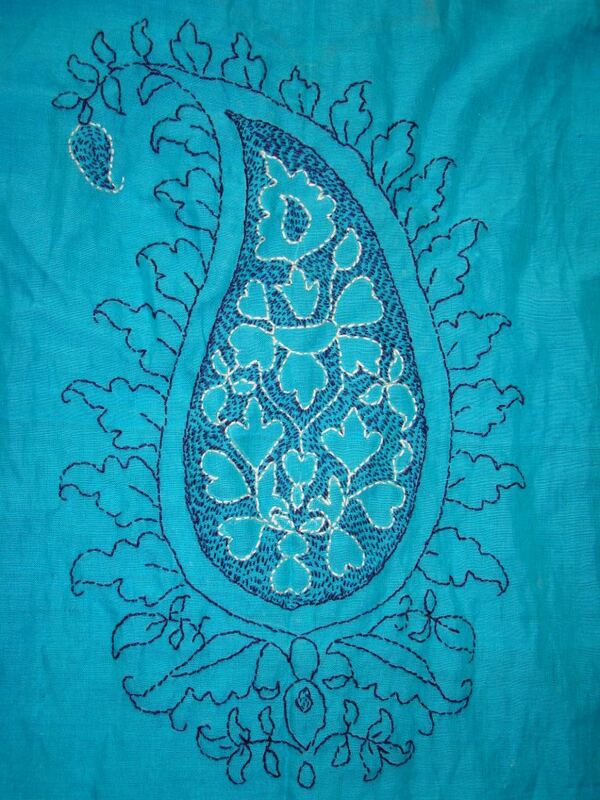 The completed kantha embroidery paisley on my next post. I found this paisley pattern somewhere on the net. Thought it can be used for kantha[running stitch] work. I just had to make very small adjustments, to make the pattern symmetrical. 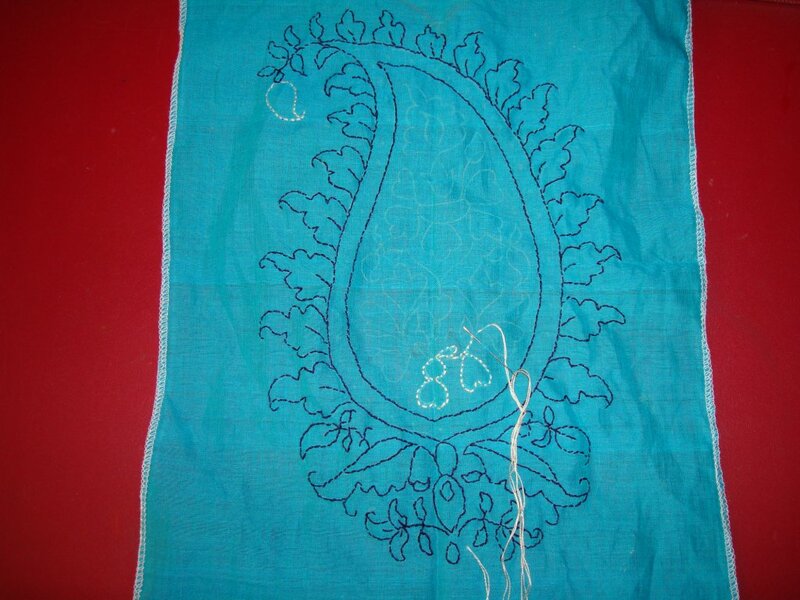 I had a blue[another] blue mangalagiri cotton fabric, I also found a dark blue managalagiri[again] with border,this border I used for sleeves. Dark blue and half/white colours threads were used for embroidery. Now for the actual embroidery- the outer pattern of the paisley was worked in dark blue, I have started with half white on the inner pattern in this picture. These are worked in back stitch with three strands of thread. The filling stitch details will be on my next post.